Entering our 21st year, we can honestly say that this program is consistently cited as being “the best camp ever” by our attendees. 2019 sessions run weekly from June 10th through August 30th. Who is the The Ultimate Kids Fishing Expereince for? 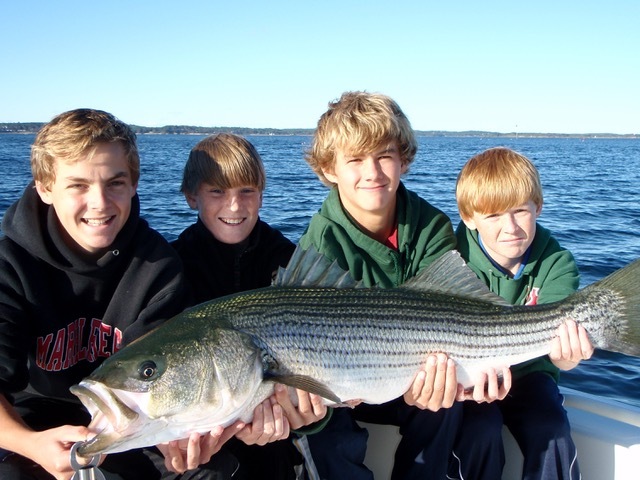 The Ultimate Kids Fishing Experience is a unique, boat-based program for boys and girls aged 8 – 16 years old. No experience is necessary, just an interest in the outdoors, the marine environment, and fishing. Kids should be physically able for the environment and be able to move around in a small boat. Kids sign up for a week-long session ... Either mornings (8:00 - 11:00) or afternoons (12:00 - 3:00). Some kids, who are really into fishing, will the full day session … which may be a “double” session, meaning both morning and afternoon for the week, or full days leaving at 8:00 and returning at 2:30. In terms of the fishing action, there isn't really a "better" time ... The afternoons typically fish as well or better than the mornings, but people seem to prefer the morning sessions … So it's more about what works best for you. We set up boats with groups of four to five kids. We try to group them by similar age, and certainly honor any requests to be together (friends, brothers, etc.). Once the kids are in a group, they rotate boats each day, so they typically spend time with me (Randy), as well as my partner Pete, and/or our other guides. We have boats leaving from Marblehead for every session, and most weeks from Tuck’s Point in Manchester Harbor. A typical day has us fishing for bait to start the trip, then live bait fishing for bass and bluefish, and then checking a few lobster traps on the way in. Some days we’ll head further out bottom fishing, and occasionally we’ll head offshore tuna and/or shark fishing. The fishing is generally really good two or three days, good one or two days, and fair one or two days. Even on the "fair" days, we find plenty of ways to have fun. We try to release most of the fish that we catch, typically keeping just one or two each day. We ideally finish each day with a little biology session (A.K.A. Blood ‘N Guts) at the dock. We fillet a fish or two, see what it ate, investigate its internal anatomy, etc. For some kids, this is the best part of the day, and also provides for a nice dinner. To be sure, this is a "Fishing" program, not a "Fish Market" program. Each student will typically bring fish home once or twice during the week. The cost per child per session(week) is $425 for half day sessions, $695 for full day sessions. A completed registration form and a $100 deposit are needed to get on the schedule, though if you have a particular session that you know you need, I can pencil them in while waiting for the registration form. PLEASE NOTE: Completing the on-line registration form does not guarantee you a spot. You MUST communicate w/me via email to assure a spot is available. If you have a child who is interested in the outdoors, they will probably find this experience to be one of the highlights of their summer. Please feel free to email (Randy@Striper.com) with any questions at all.